Rhinitis is not a disease: it is simply a term describing the symptoms produced by nasal irritation or inflammation. Symptoms of rhinitis include runny nose (rhinorrhea), itching (pruritus), sneezing and stuffy nose (blockage or congestion). These symptoms are the nose's natural response to inflammation and irritation. The nose normally produces mucus, which traps substances like dust, pollen, pollution and germs such as bacteria and viruses. Mucus flows from the front of the nose to the back and is swallowed, but when mucus production is excessive, it can flow from the front (runny nose) or become noticeable from the back (post-nasal drip). Nasal mucus, normally a thin, clear liquid, can become thick or colored, perhaps due to dryness, infection, or pollution. When post-nasal drip is excessive, thick, or contains irritating substances, cough is the natural response for clearing the throat. Itching and sneezing are also natural responses to irritation caused by allergic reactions, chemical exposures (like cigarette smoke), temperature changes, infections and other factors. The nasal tissues congest and decongest periodically. In most people, nasal congestion switches back and forth from side to side of the nose in a cycle several hours long. Some people, especially those with narrow nasal passages, notice this nasal cycle more than others. Strenuous exercise or changes in head position can affect nasal congestion. Nasal congestion is also the natural response to irritation and inflammation. Severe congestion can result in facial pressure and pain, as well as dark circles under the eyes. Sinusitis is inflammation or infection of any of the four groups of air sinus cavities in the skull, which open into the nasal passages. Sinusitis is not the same as rhinitis, although the two may be associated and their symptoms may be similar. The terms "sinus trouble" or "sinus congestion" are sometimes wrongly used to mean congestion of the nasal passage itself. Most cases of nasal congestion, though, are not associated with sinusitis. Arbitrarily, rhinitis lasting less than six weeks is called acute rhinitis, and persistent symptoms are called chronic rhinitis. Acute rhinitis is usually caused by infections or chemical irritation. Chronic rhinitis may be caused by allergy or a variety of other factors. The symptoms of allergic rhinitis (called "hay fever" sometimes, but not caused by hay and not associated with fever) are caused by exposure to substances (allergens) to which the patient has become allergic. Common allergens are tree, grass, and weed pollens, molds, animal hair and dander, and house dust mites. In general, pollen (and sometimes mold) allergy causes symptoms at certain times of the year, while mold, animal dander and dust mites cause symptoms year round. People with allergies have developed antibodies to these allergens. These antibodies circulate in the blood stream, but localize in the tissues of the nose and in the skin. This makes it possible to demonstrate presence of these antibodies by skin testing, or less commonly, by a special blood test. A positive skin test mirrors the type of reaction going on in the nose. Not everyone with symptoms of rhinitis has allergies, and not everyone with allergies has rhinitis. Rhinitis may result from many causes other than allergic reaction. In fact, the most common condition causing rhinitis is the common cold. Colds can be caused by any of more than 200 viruses. Children, particularly young children in school or day care centers, may have from 8-12 colds each year. Fortunately, the frequency of colds lessens after immunity has been produced from exposure to many viruses. Colds usually begin with a sensation of decongestion, rapidly followed by runny nose and sneezing. Over the next few days, congestion becomes more prominent, the nasal mucus may become colored, and there may be a slight fever and cough. Cold symptoms resolve within a couple of weeks although a cough may sometimes persist. Cold symptoms that last longer may be due to other causes of chronic rhinitis or to sinusitis. Not all symptoms in the nasal passage are caused by allergy or infection. Similar symptoms can be caused by mechanical blockage, use of certain medications, irritants, temperature changes or other physical factors. Rhinitis can also be a feature of other diseases and medical conditions. Drug-induced nasal congestion, called "rhinitis medicamentosa “ can be caused by birth control pills and other female hormone preparations, certain blood pressure medications (beta blockers and vasodilators), and prolonged use of decongestant nasal sprays. Decongestant nasal sprays work quickly and effectively, but they alter normal nasal physiology. After a few weeks of use, nasal tissues swell after the medication wears off. The only thing that seems to relieve the obstruction is more of the medicine, and the medication's effect lasts shorter lengths of time. Permanent damage to the nasal tissues may result. Consultation with a physician to "get off' the medication is often necessary. Cocaine also alters normal physiology, causing a condition identical to that produced by decongestant nasal sprays. If you use cocaine, it is important to tell your physician so that appropriate therapy can be prescribed. "Vasomotor rhinitis" is a term used to describe a group of poorly understood causes of rhinitis, with symptoms not caused by infection or allergy. Many people have recurrent nasal congestion, excess mucus production, itching, and other nasal symptoms similar to those of allergic rhinitis, but the disorder is not caused by allergy. Irritants that can trigger vasomotor rhinitis include cigarette smoke, strong odors and fumes (perfume, hair spray, other cosmetics, laundry detergents, cleaning solutions, pool chlorine, car exhaust, and other air pollution). Spices used in cooking can cause nasal irritation, producing a condition called "gustatory rhinitis." Other things that can aggravate vasomotor rhinitis are alcoholic beverages (particularly beer and wine), aspirin, and certain blood pressure medications, such as reserpine and propranolol. Some people are very sensitive to abrupt changes in weather or temperature. Skiers often develop a runny nose -"skier's nose" - but in some people any cold exposure may cause a runny nose. Others start sneezing when leaving a cold, air-conditioned room. These agents are not allergens, do not induce formation of allergic antibodies, and do not produce positive skin test reactions. Occasionally, one or two positive skin tests may be observed, but they do not correlate with the history and are not relevant or significant. The cause of vasomotor rhinitis is not well understood. In a sufficiently high concentration, many odors will cause nasal irritation in almost anyone. Some people, though, are unusually sensitive to irritation, and will have significant nasal symptoms even when exposed to low concentrations of irritants. Thus, vasomotor rhinitis seems to be an exaggeration of the normal nasal response to irritation, occurring at levels of exposure which don’t bother most people. It occurs more often in smokers and older individuals. As is the case with allergic rhinitis, vasomotor rhinitis often can't be cured. Fortunately, symptoms can be kept under control by avoiding or reducing exposure to substances that cause symptoms, and by taking medications when needed. Patients with vasomotor rhinitis should not smoke or permit smoking in their homes. Dryness of the nasal tissues can be a normal effect of aging, or a characteristic of "rhinitis sicca," which may be associated with a foul smelling nasal discharge. Rhinitis can also be a feature of endocrine disease like hypothyroidism or can occur during pregnancy. Rhinitis can be made worse or even improved during pregnancy. Alcoholic beverages can cause the blood vessels in the nose to enlarge temporarily and produce significant nasal congestion. Consult your physician. Sometimes several of the above conditions can coexist in the same person. In a single individual, allergic rhinitis could be complicated by vasomotor rhinitis, septal deviation (curvature of the bone separating the two sides of the nose) or nasal polyps. Use of spray decongestants because of chronic sinusitis, septal deviation or vasomotor rhinitis may cause rhinitis medicamentosa. Any of these conditions will be made worse by catching a cold. Nasal symptoms caused by more than one problem can be difficult to treat, often requiring the collaboration of an allergist and an otolaryngologist (ear, nose and throat specialist). Nasal surgery will usually cure or improve symptoms caused by mechanical blockage or chronic sinusitis not responsive to prolonged antibiotics and nasal steroid sprays. Stopping the use of offending medications will cure rhinitis medicamentosa, providing that there is no underlying disorder. When no specific cure is available, options are ignoring your symptoms, avoiding or decreasing exposure to irritants or allergens to the extent practical, and taking medications for symptom relief. Antihistamines are the most inexpensive and commonly used treatment for rhinitis. They dry excess secretions and reduce itching and sneezing, but may not do much for nasal congestion. There are dozens of different antihistamines and wide variations in how individual patients respond to them. Some are available over the counter and others require a prescription. Generally, they work well and produce only minor side effects. 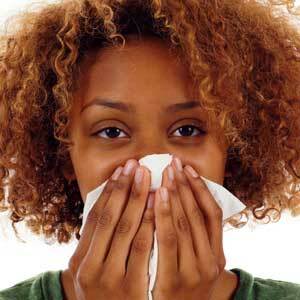 Persons with nasal dryness or thick nasal mucus should avoid taking antihistamines without consulting a physician. Contact your physician for advice if an antihistamine causes drowsiness or other side effects. Nonprescription decongestant nasal sprays work within minutes and last for hours, but can't be used for more than a few days at a time without a physician's order. Oral decongestants are found in many over the counter and prescription medications, and may be the treatment of choice for nasal congestion. They don't cause rhinitis medicamentosa, but need to be avoided by some patients with high blood pressure. If you have high blood pressure, you should check with your physician before using them. Using an over the counter saline spray will help counteract symptoms of dry nasal passages or thick nasal mucus. Unlike decongestant nose sprays, a saline nose spray can be used as often as needed. Sometimes, your physician may recommend washing (douching) of the nasal passage. Corticosteroids counteract the inflammation caused by release of allergic mediators, as well as that caused by other nonallergic factors. Thus, they generally work for many causes of rhinitis symptoms and are sometimes useful for chronic sinusitis. Corticosteroids are sometimes injected or taken orally, but usually on a short term basis for extremely severe symptoms. Physicians warn that injected or oral steroids may produce severe side effects when used for long periods or used repeatedly and, for this reason, they should be used with extreme caution. In rhinitis, a corticosteroid is much safer when used topically by spraying it into the nose. Cromolyn is a medication that blocks the release of chemical mediators. It does not work in all patients. It must be used at least four times daily, and improvement may take several weeks to occur. Atropine and the related drug ipratropium bromide are sometimes used to relieve symptoms of rhinitis: in fact, most antihistamines have a slight atropine-like effect. Atropine can be taken orally, and it is a component of some antihistamine decongestant preparations. Atropine and ipratropium are not yet commercially available as nasal sprays. Antibiotics are for the treatment of bacterial infections. They do not affect the course of uncomplicated viral upper respiratory infections (common colds), and are of no benefit for non-infectious rhinitis, including allergic rhinitis. In chronic sinusitis, antibiotics may help only temporarily, and surgery may be needed.